It's not April Fools - it's actually April as of today! Spring is here! Today is also Laurie's birthday! Last Monday was Scott's birthday. Last year I surprised him with a trip to NYC. That was so much fun. I didn't quite pull off anything like that this year. But I did drive over and surprise him and pick him up from work and take him to lunch. He works about 40 min away from our house. We had a nice lunch and by the time I got home and picked up the kids from school - I felt awful. I came down with a 24 hour stomach virus. It was rough. I spent Tuesday morning in bed. Will Holden was home with me and I was so thankful he's almost 4 and pretty independent because I was drifting in and out of sleep and he basically watched TV and got anything to eat he wanted out of the pantry. ha! But we both survived. Wednesday the girls both had picture day. Harper also had a field trip to Fayetteville. They went to a play and they went to the Fayetteville mall and ate lunch at the food court. I sent her money and it seemed so grown up to me that she could order her own food and keep up with the change. I don't know why - but it's the little things. Thursday I stayed home and deep cleaned the house. It was a cool day and I opened all the windows. I love the feeling of a cool breeze coming in and birds chirping in the trees. I feel like there are only about 4 days like that in Arkansas when it's not too cold or too hot. I LOVE LOVE gingham. I found these cute melamine plates at Walmart! And bowls! I didn't get them but I went back. $1.50 each! I couldn't pass that up! They are navy and so cute! I found them online for you! One of my best friends was back in town for a wedding this weekend. Her whole family was in the wedding so it was fast and furious but we managed to slip in a little time with her on Friday morning at breakfast. We sat around my friend Marci's table and talked and talked until past lunch time. 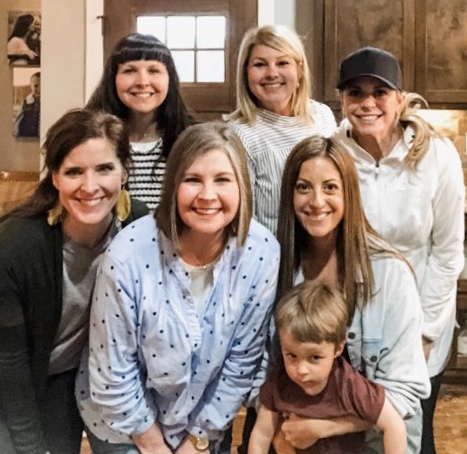 It was SO good to be together! Her daughter Kampbell is Hollis' best friend. These two love each other. They have really missed each other. So I got K and she spent the afternoon with us. She had to leave and go to the wedding rehearsal and Hollis went to a swimming birthday party for one of her best friends at school. Then Kampbell came back and spent the night. 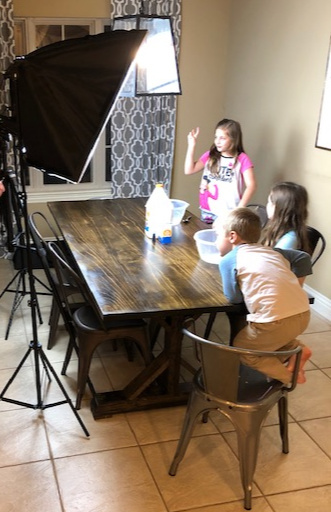 And somehow I let them talk me into making slime and a you tube video. We didn't have any contact solution and I found myself at Walmart at 9 p.m. buying some so they could finish their slime. They made slime and rode hover boards and watched you tube videos. That pretty much slimes up what 8 year old girls are like. They hung out Saturday morning until K had to go get ready for the wedding. Soccer got cancelled because he was cold and raining. We went grill shopping. Ours bit the dust last summer and we have needed a new one for a while. Then we had a late lunch and a few of us got ice cream. The girls have gotten into making animation videos with their Barbies (or WH's robots). They spent hours this weekend doing them. I need to share one sometime. I get asked a lot what hover board my girls have. This is what they got for Christmas. It's fairly inexpensive and it works great! They love them and hover all over the house in them. It's been a great gift! 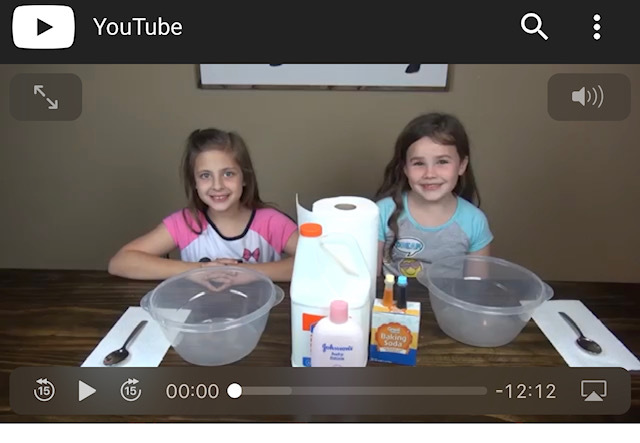 You can let your kids watch the slime video they made! They are so proud!